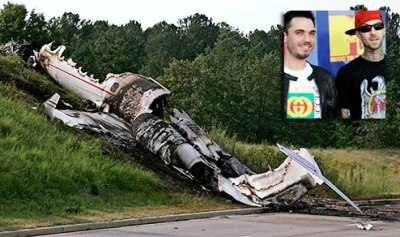 Travis Barker And DJ AM Severly Burned In Plane Crash. The next time you think you’re invincible, remember this….. Hours after performing for thousands of South Carolina college students, former Blink-182 drummer Travis Barker and celebrity DJ AM were critically injured in a fiery Learjet crash that killed four people, authorities said Saturday. Officials said the plane carrying six people was departing shortly before midnight Friday when air traffic controllers reporting seeing sparks. The plane hurtled off the end of a runway and came to rest a quarter-mile away on an embankment across a five-lane highway, engulfed in flames. Barker and DJ AM, whose real name is Adam Goldstein, were in critical but stable condition at a burn center in Augusta, Ga., on Saturday afternoon, hospital spokeswoman Beth Frits said. Augusta is about 75 miles southwest of Columbia. One witness said he was driving when a fireball streaked across the highway about 600 feet ahead of him. William Owns said he approached to see the two survivors frantically trying to remove their burning clothes. “I noticed two guys who were on fire and it looked like a dance: They didn’t know what to do,” said Owens, a 60-year-old delivery van driver. Goldstein had stripped off his own shirt and was helping Barker strip naked, said Owens, who was able to identify the men Saturday night because of news reports that showed Barker’s extensive tattoos. Owens said Goldstein told him four other people were on board the jet, but the flames were too intense to get close. Two other passengers — Chris Baker, 29, of Studio City, Calif., and Charles Still, 25, of Los Angeles — died, as did pilot Sarah Lemmon, 31, of Anaheim Hills, Calif., and co-pilot James Bland, 52, of Carlsbad, Calif., according to the county coroner. Baker was an assistant to Barker and Still was a security guard for the musician. It is being reported that Travis Barker has been burned from the waist down, and DJ AM’s injuries are mostly to his face; he is currently in a doctor induced coma. There was talk going around that the group was flying home so Chris Baker could be there when his wife gave birth, but it was just rumor; Baker’s wife isn’t even pregnant. This is the second tragedy to hit Chris Baker’s family in the last month; a few weeks ago his younger brother was killed in a motorcycle accident. This whole damn thing is just so tragic. My heart goes out to all in involved and their families. previous post: Jessica Simpson Is A Drunk And Elisabeth Hasselbeck Is Finally Leaving. next post: 60th Annual Emmy Awards. Minute By Minute. Freudian slip, “waste”? LOL! Sorry, couldn’t resist. But how horrible! Just goes to show no one is immune from catastrophe. Hope both of them heal quickly. Condolences to the families who lost loved ones. D’oh! I fixed it. Not a Freudian slip that I know of, but maybe Freud knows better than I do. 53 queries in 1.070 seconds.